Family bodega Frias Del Val was founded in 1969, the ‘Hermanos’ – meaning ‘brothers’ – added in 1999 when the current generation of siblings took over. 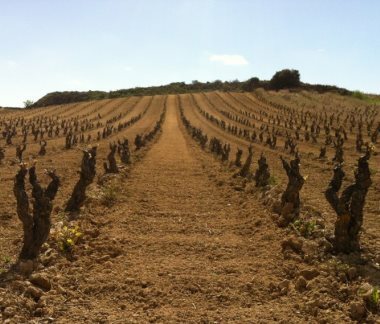 Farming 25 hectares of their own vineyards, some vines are over 100 years old, planted 90% to Tempranillo, along with 9% of white varieties Viura and Malvasia, and a further 1% of unspecified ‘other’ varieties. There are new French oak barriques in the cellars, as well as stainless steel and cement tanks for fermentation. The top white wine, Viña ‘El Flako’ is so called as it is the nickname of one of the Frías Del Val brothers. Frias Del Val belongs to an independent association of family bodegas across Spain called the Bertha Group, other members of which have been reviewed previously on wine-pages. This is another quality bodega, though their wines appear not to be available in the UK at time of review. (2017) Fragrant stuff, blending the custard and cream of barrel fermentation with the floral aspect of the Malvasia, and crunch of the Viura. Weighty and substantial with 14.5% alcohol, serve this not too cold to bring out the full bodied richness of the fruit, which is nicely counter-balanced by cool acidity and that mealy richness and texture. (2017) A selection from the oldest Tempranillo vines on the property, this is meaty and earthy, a touch of tobacco spice, a touch of leather. On the palate the sweet ripeness of the berry fruit comes through, but so does plenty of alcohol and a slightly astringent character. Concentrated for sure, but a tiny bit over extracted too in my opinion. (2017) Aged in new French oak for 15 months and a further two years minimum in bottle, this is a selection of the best Tempranillo fruit. Fine nose, the graphite and firm smoky character of the oak nicely set against tight blue/black fruit, blueberry and blackcurrant. Some tobacco comes through. In the mouth it is savoury, taut and firm, a real grip to the tannins and the oak a touch prominent, but it just about has the fruit density and sweetness to handle it. Spicy in the finish. (2017) A fairly punishing 15.5% alcohol declared on the label for this selection of the oldest vineyards and best fruit that tops the range. Only 150 cases were produced. The colour is saturated and opaque and the nose closed and dramatically dark. Some cocoa perhaps? Definitely some dense, blue/black fruit coming through like damsons and blueberry. Subtle French oak. In the mouth this is voluptuous, smoky and creamy, full and dense and whilst clearly the onslaught of alcohol and oak is considerable, it seems better balanced than the Seleccion Personal, the grip of the oak tannins, bittersweet twist of fruit and acid, combining in a long, concentrated and powerful finish. Impressive of its fairly massive style.